Tetsuya Nomura would love to add iconic Star Wars characters to the Kingdom Hearts universe, if only Disney would let him. 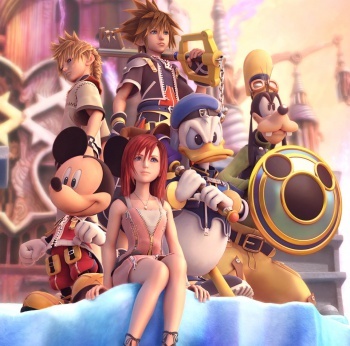 Kingdom Hearts lives and dies on the strength of the characters it can attract. Yes, the franchise has spawned original entities, but the real draw of the series has always been in the Disney and Final Fantasy characters it features. Sephiroth throwing down against Donald Duck? Yeah, that's totally a thing in Kingdom Hearts, and this onslaught of beloved properties has made the franchise one of the most beloved among Square Enix properties. If any one thing could automatically boost Kingdom Hearts' inherent appeal, it would be new iconic characters. Fortunately, Disney recently acquired both Marvel Comics and Lucasfilm. It's a silly question to ask Kingdom Hearts director Tetsuya Nomura if he has interest in Lucasfilm's Star Wars characters (because of course he does), yet a French Final Fantasy fansite called "Finaland" recently did just that. "... we've been talking about Star Wars itself since it became Disney's content recently," Nomura states. "When I heard the news I was like 'Wow! Wow!' Obviously it's gonna be great if we could add it, but like I said, there are a lot of restrictions and rules by Disney so we don't know what's gonna happen, but yeah, we'll see," he adds. Is this a guarantee that Kingdom Hearts IV will star Darth Vader, Han Solo and Boba Fett? Not at all. Far from it. Nomura is interested in the idea, and the premise of Kingdom Hearts could allow for the integration of Star Wars characters, but as was stated above, Disney is very protective of its intellectual property - especially those properties as exceedingly valuable as Star Wars. Nomura would likely have to present a convincing plan to the heads of Disney that outlines exactly how the Star Wars characters would be included in Kingdom Hearts, and why any of this might be a lucrative concept. Then again, this is Star Wars characters meeting and fighting alongside figures from Disney and Square Enix. If that isn't a recipe for comically huge bags of cash, I don't know what is.